There is growing concern over the state of healthcare in Nigeria. Many pundits have it that there is no future to the country’s healthcare system. According to them, it is a scenario where uncertainty governs access and the structure is largely powered by out-of-pocket payments in the private sector and an over-burdened public sector. The answer does not even lie in government simply putting more money in the health sector, but the solution is restoring the confidence of the Nigerian public in the system. It was not surprising therefore that the issue was a focus on the a recent summit in Lagos, tagged, ‘Future of Health In Nigeria’ organised by Royal Philips, one of the global leaders in health technology, in collaboration with KPMG Africa. The deliberation which attracted many health industry key players who brainstormed on way forward for the sector witnessed the release of a new health survey in Nigeria. The survey also highlighted a clear discrepancy between the expectations of Nigerians and the reality of the healthcare system, indicating inefficiencies and ample room for growth. With more than half of Nigerians leaning on hospital facilities for the most minor of ailments, there is a clear need for improved access to primary care practitioners, local health facilities, tracking health indicators and a wider availability of information about health, nutrition and fitness. Commenting, Radhika Choksey, Philips Group Communications, Africa, explained that the survey was aimed at understanding what the ‘Future of Health’ might look like in the country and its associated challenges. Choksey further said that the Agency One Voice Connect conducted the survey online between April 11 and 24, 2018 among 503 Nigerian adults, majority of whom are aged from 18 to 34 years. A breakdown of the geographical zones involved in the survey showed that 80 per cent of urban/city were covered, while 13 per cent and six per cent consisted of the suburb as well as rural areas respectively. Further analysis of the regions showed that the North Central states of Benue, Kogi, Kwara, Nasarawa, Niger, Plateau, Federal Capital Territory comprised 17 per cent of the figure, while North East states Adamawa, Bauchi, Borno, Gombe, Taraba and Yobe consisted four per cent. Seven per cent of the figure came from the North West states including, Jigawa, Kaduna, Kano, Katsina, Kebbi, Sokoto, Zamfara; South East states including, Abia, Anambra, Ebonyi, Enugu and Imo made up eight per cent of the figure. However, 16 per cent of the figure was from the South South states including Akwa Ibom, Cross River, Bayelsa, Rivers, Delta and Edo and the South West states – Ekiti, Lagos, Ogun, Ondo, Osun, Oyo shared the remaining 48 per cent. On his part, Kunle Elebute of KPMG Africa declared open the summit with his discourse on the importance of partnerships towards ensuring equitable healthcare. He stressed on the importance of harnessing capacity in the private healthcare sector to fill gaps in the public sector. In his keynote address, Michael Jackson, healthcare futurist, spoke about the recipe for change which includes computing, communications, connectivity, among others. Jackson also illustrated the changing face of technology and how this has impacted the world and the day to day life of its people. He spoke about the evolution of business which now focuses more on skills, knowledge, decentralisation, partnerships and digital engagement and the fast pace of technological development, encouraging healthcare professionals to emulate this progression in rolling out digital healthcare solutions for Nigeria and Africa. 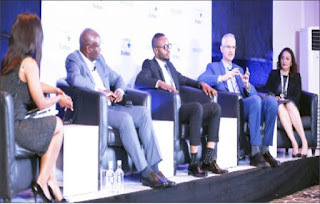 There was a panel session which looked into the role of technology in the transformation of healthcare in Nigeria during which Jasper Westerink, CEO, Philips Africa, posited that besides the provision of important healthcare solutions through technology, Philips is committed to educating and creating awareness towards the reduction of risk factors associated with unhealthy lifestyles. He added that provision of technologies that enable a healthy lifestyle also remained a key priority for Philips Africa. Westerink also gave specific examples of healthcare product innovations from Philips such as handheld probes and the importance of training opportunities for non-healthcare professional to operate them. He said that having a wide spectrum of healthcare attendants embedded in communities would go a long way to fixing issues with the overburdened primary healthcare systems. He noted that access to technologies that capture early diagnosis is another way to alleviate this burden. The Philips Africa CEO emphasised the need for collaborations, partnerships and the provision of fast-paced healthcare technologies towards making positive impact on lives. He noted that challenges exist but so do opportunities to bring together resources and partnerships to leapfrog sustainable healthcare in communities. Citing the private sector, government and Nigeria’s young and vibrant population as key stakeholders to bring to the table, he concluded the session by reiterating the importance of education, prevention, focus on acute challenges and harnessing the resources of stakeholders who want to make a change in Nigeria’s healthcare sector. He added that in principle one could solve Nigeria’s healthcare challenges with the structures in place. Furthermore, he gave examples of digital, connected technologies being developed in Africa and delivering healthcare solutions to Africans today. He cited the example of Philips’ community life centres using solar power in Kenya. He said that technology can help tackle challenges right here in Nigeria such as the inequitable ratio of (one medical doctor) 1 MD: 25000 patients and the language gap across the 500 dialects spoken here, encouraging healthcare professionals to adopt this tactic: simplify, smarten-up, specialise. Dr. Jide Idris, Commissioner of Health, Lagos State, in his submission touched on the importance of training to ensure healthcare professionals are well-equipped, applied technologies, health promotion and preventative solutions. He also spoke about the importance of communication and behavioural change initiatives in order to leapfrog from education to ensuring that technologies are well understood and applies in communities. Another discussant, Ms. Clare Omatseye, President, Healthcare Federation of Nigeria, opined that with technology being a major driver of change, especially today when patients are digitally and empowered, healthcare solutions must be incorporated into everyday innovations and meet patients where they are. She added that while Nigeria has as many skilled consultants in other countries such as the USA and the U.K. due to brain-drain, there was a need to close the digital divide so that consultancy services can be delivered seamlessly across borders. She observed some challenges facing the healthcare sector including financing and access to capital as well as the importance of collaboration with sectors outside healthcare in order to deliver viable solutions. Focusing on the issue of brain-drain, she said that some of the top reasons for this including remuneration, access to technologies and better working environments all of which she said can be fixed with the right level of commitment and investment. She also talked about Nigeria’s vibrant private healthcare sector, which is unfortunately fragmented due to gaps in solutions. She said it was important for government to partner the private sector and bring in their passion in order to achieve the ideal formula for success in healthcare delivery. She then decried the phenomenon of patients getting more impoverished when they get sick and the need for alternative and cost effective means to access quality healthcare through PPP is made available to all. She encouraged governments to provide a pool of funds towards this, to advocate for mandatory universal healthcare and to spend more time on prevention rather than cures. On his part, Martins Ifijeh, Head, Health Desk, This Day Newspaper, talked extensively about the need for prioritisation by government of more budget allocation to healthcare provision in Nigeria. He said Nigerian government could do more with regards to universal health coverage, stating that it has to be constitutionally mandated to achieve the desired results. He also said that the issue of universal healthcare should be highlighted more in Nigeria’s political discourse and emphasised the need for collaboration between government and stakeholders.